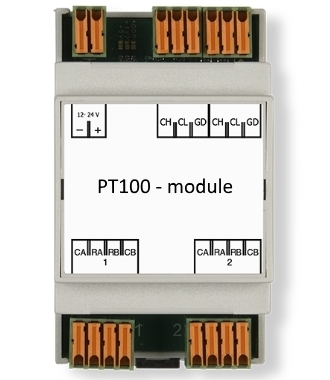 The PT100(0) CAN-bus module is an industrial module which has dual temperature sensor inputs. The module supports PT100, PT1000 and NTC temperature sensors and converts the temperature with 12-bits accuracy. The module has CE certification for both industrial and home use. The module uses simple CAN-bus packets and transmits temperature every second. Upon special request the module software can be updated to increase the frequency. With dual independant 12-bit temperature compensated analog-to-digital converters the PT100 module is able to measure very accurate over a wide input range. This makes the module ideal for industrial applications. The module has an internal ARM Cortex-M0 processor which runs at 48MHz. CAN-bus messages are processed quickly and there is room for custom application code if required. This way we can program the module to send out a signal to our digital CAN-bus module if a certain setpoint is measured.